How lucky I am to be living so close to Attenborough Nature Reserve. This award winning Visitor Centre is a beautiful design and run on ecological principles. Another recent painting based on a drawing made in the studio of the Nottingham Society of Arts. The two ladies were chatting and enjoying a coffee during a break in our painting session. I couldn’t resist making a painting of them. I have just sold this painting at the Nottingham Society of Artists on Friar Lane. It’s available to view untill 4pm on Easter Sunday. One of my favourite views of Swansea Bay. 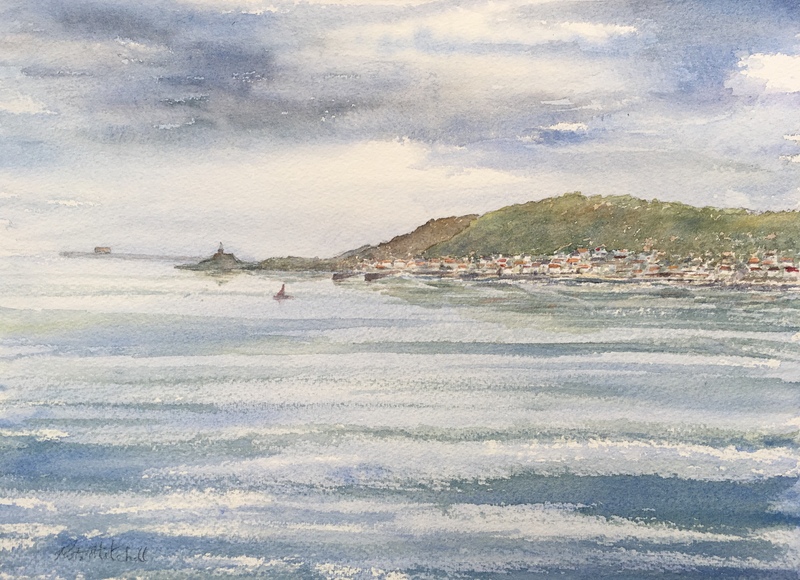 This one looks out from Oystermouth Castle in the autumn towards Mumbles Head and the lighthouse. Often referred to as the Gateway to Gower it’s popularity has never waned since in Victorian times, a railway ran around the bay making it accessible for all. I have been inspired by my recent visit to Gower on the South Wales Coast. It’s my favourite place to visit as I spent many hours there painting the lovely scenery for the calendars and cards which I published while I lived in Swansea. I am working on another one. I’ll post it soon. This Collage is a new work and is now on exhibition at the Nottingham Society of Artists’ Gallery in the Fellows exhibition. The exhibition finishes on Sunday 21st April so you may just have time to see it. Castle Coch, Near Cardiff, South Wales. This beautifull castle is now in great demand as a wedding venue. The painting was a favourite one and appeared on the cover of a Wales in Watercolour Calendar. I am looking back through my print archives before I start a new season of painting. A few images are mulling around in my head and I have been gathering a few blank canvases. This watercolour of Swansea Marina was quite large and certainly took many hours to paint. I am going down to Swansea soon and I will be getting more inspiration from beautiful Gower. I love drawing on a large scale with charcoal. You have to stand at an easel and act like a proper painter; standing back and lurching forward and waving your arm about. These two drawings arrived when I was doing just that. Classic FM on the radio helps as well. Yet another watercolour sky. There is somehting very satisfying about letting the watercolour run and merge.